When you rent our Jeep you have the freedom to take it where ever you want. You get a modern Jeep Rubicon Unlimited that comes equipped with 2 inch lift, selectable front and rear lockers, front sway bar disconnect, Sirius XM radio, remote start, and of course all the other modern equipment such as, A/C, heater, power windows, power locks, and factory safety features. There are several excellent Jeep trails that are accessible right from our facility. If you want amazing views, including views of Zion, there is Smith Mesa and Gooseberry Mesa. If you want water and sand there is Sand Hollow State Park, and right across the street there are full-on sand dunes. If you want rock crawling there are several trails on top of Sand Mountain Mesa that range from beginner to advanced. 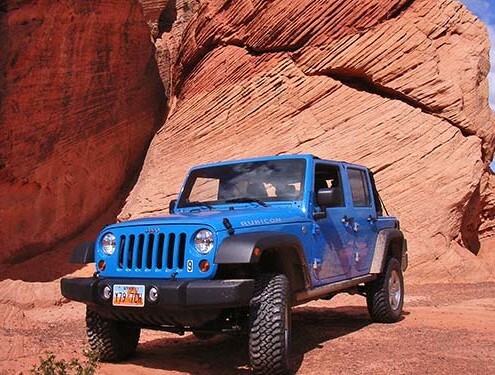 The options for Jeeping in Southern Utah are endless but we will help you find any trail you want to explore.